I just read Frank Somerville’s recent post (July 3) on Facebook. For the record, he’s the nightly news anchor on KTVU in Oakland, CA. I don’t live anywhere near the West Coast, so I don’t get to watch him, but Somerville keeps a page on Facebook that I read daily for its keen insights, sensitivity, and passion for social justice. Thank goodness he’s out there and how I wish there were more people like him, concerned about doing the right thing. I say this because, quite frankly, I’m damned tired of running into people on a daily basis who, just the opposite, are full of themselves in their thoughtlessness towards others, and making matters worse, frequently mean and calculatingly offensive. Unfortunately, the downside of technology can be the marginalization of community, despite a plethora of social media. Somerville laments how many people use the Internet to get back at others. 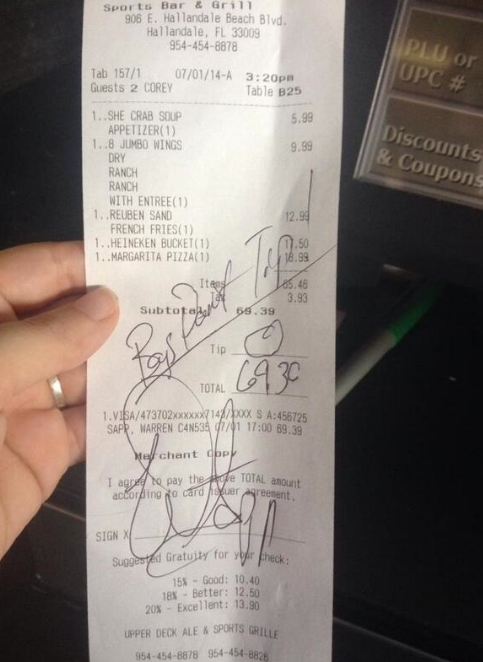 Case in point, a waitress posting the $69 dining bill of former Oakland Raider Warren Sapp, who hadn’t left her a tip. Clearly, she sought to embarrass and humiliate Sapp, who later said that he didn’t like the service and her calling him and his friends boys. I know that I’ve done the same thing as Sapp on rare occasions. Tipping is a way of saying thank you and, likewise, an incentive to serve the public well. In Europe, you don’t generally tip, since a service charge is included, and, believe me, the service can get pretty lousy. Meanness, unfortunately, runs amuck on the Internet due to the anonymity it provides for angry types low on self-image seeking compensation. I remember Edgar Allen Poe writing in his goose-bumpy short story, “The Cask of Amontillado,” of that most perfect kind of vengeance that allows its perpetrator impunity, or escape from accountability. I often see Poe’s maxim raise its ugly head in reader comments, especially in discussion forums, and of course, par excellence, Twitter and Facebook. I find myself aghast, not only at the repugnant foreclosure of other viewpoints, but the sheer cowardice it masks, latent with resentment and a need to enhance self by controlling others or turning them into punching bags. Sadly, there have been instances where such verbal pugilism has taken on fatal consequences. More often, I see the pervasive fallout of anonymity virtually daily when, like Somerville (more below), I’m driving, motorists who think rules are for other people–deliberately running traffic lights, stop signs, or not yielding right of way, or pulling out in front of you, or not signaling, or slowing traffic to a snail’s pace while on their cell phone or texting in public mastabatory self-indulgence. My wife came home the other day, telling me of a woman who turned in front of her at a three way stop. She gave her the horn, getting the one finger salute in return. I’ve counseled her to not let such ilk spoil her day. You also just don’t know who you’re up against. Stats tell us an estimated 1500 die in road rage incidents every year. Anyway, I sometimes think there really is a bit of karma going around and that the chickens ultimately come home to roost. Somerville ends his blog with his account of a guy with a mounted camera on his dash who comes up behind him “for no apparent reason” as he is on his way to work. Turns out, he can’t get rid of him. Pulling over, the guy draws along side of him, and Somerville, not wanting the incident to escalate, calmly asks, “What are you doing?, only to have the guy grin and keep videotaping him. Speeding off, Somerville finally loses him. Hey, so creepy! You just never know what kind of oddball that anonymity may confront you with next. This entry was posted in Books, Lifestyle, Reflections, Technology and tagged anonymity, Frank Somerville, Internet, technology, traffic etiquette. Bookmark the permalink.